The living room is the space where you family and friends gather to relax and spend quality time. The living room is typically the space used for lounging, watching television and entertaining and in some cases dining. So how can this space be updated and given a more cohesive look without breaking the bank? How about creating an appealing and lively space that makes everyone who comes into it a little cheerier. 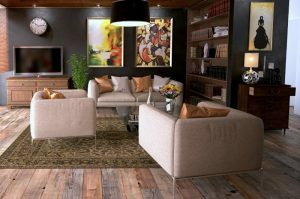 Here are some ideas you can use to freshen up your living room for any season. If your living room is also the first room family enters, or the place where most of the activity occurs. You’re probably used to seeing jackets, backpacks and toys crowding the space. Tidy up and help kids stay organized by having a dedicated area for storing toys and sports equipment. A large lidded basket is perfect for storing backpacks and toys. A simple slipcover in a neutral color gives your space a new backdrop for stylish accessories. 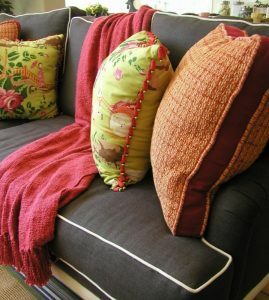 Slip covers are a splendid way to change the color and even the style of your sofa. 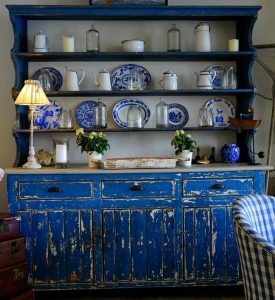 Maybe you want to change a traditional home to modern or change your garage sale find. 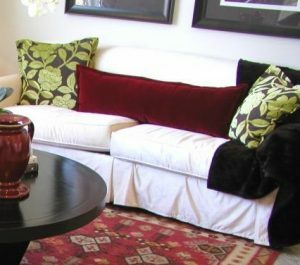 A slipcover is an easy way to freshen up the look of your living room. Don’t forget to add colorful different sized pillows for your special look. 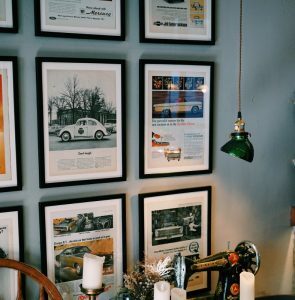 Gallery walls are more than trendy, they also are great way to showcase artwork, favorite family photos along with souvenirs, posters or even pictures from a book or magazine. Select frames the same color or really mix it up with frames in a variety of colors and sizes. Built in or free standing bookcases can go a long way for a low-cost or not cost living room refresh. Large baskets or boxes are great for concealing papers and magazines. Collect an assortment of your collectibles or interesting garage sale finds in a similar color scheme or subject. Then place them between books for relaxed balance. Don’t for get to present collection is groups of three or an odd number. 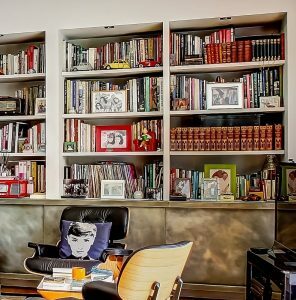 Tip: Arranging books by color gives bookshelves a designer look. 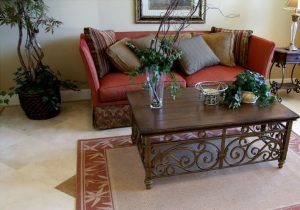 A coffee table is often the focal point of a living room. Trade out display items seasonally to highlight your personal style. Books, greenery, and cherished mementos are all make stylish candidates for your coffee table update. Try layering them on a table runner or tray. The mantel, a console table, and decorative bookcases are other locations to seasonally highlight your style. Need a modern family room design idea? Simply swap out photographs or paintings. Considering other items for display such as a quilt or mirror. 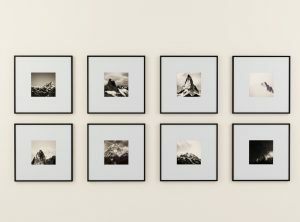 For an easy fix, use the same size artwork or photos in your picture frames. How about a cheap living room idea. Reconsider your living room furniture arrangement. Try a new strategy. Move your sofa away from the wall or place a set of chairs near the window. Think about using a furniture piece from another room. 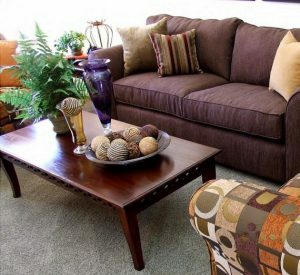 No matter your style a new furniture composition can refresh a room. 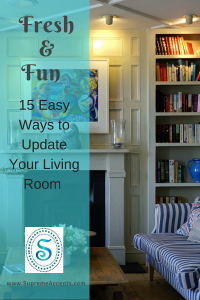 Updating a living or transforming a family room can be done without a lots of effort. A cheerful patterned rug or a fun fluffy or textured rug brings style underfoot. 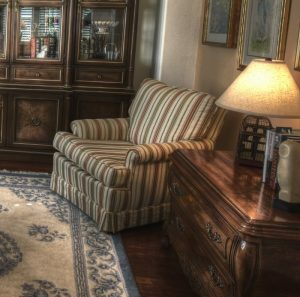 To create a more modern style, add a smaller rug on a larger area rug or carpet. Want to modernize a traditional home design or freshen up a worm chair? 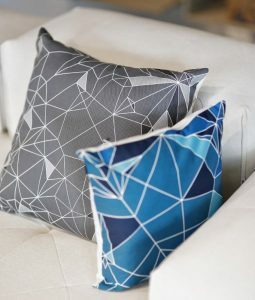 Updating living room decor begins with textiles. Consider giving a cozy armchair a new look with fresh upholstery. With good bones, a tattered chair or flea market find can easily be restored with new upholstery. Make sure to choose a great fabric. Tip: Use leftover pieces of fabric as art. Try setting them into ready-made frames fitted with basic white mats. Throws are a seamless way to jazz up a sleepy sofa or add pattern and instant color to a living room. Placing a throw over the back of a sofa gives the living room a charming look. A throw placed over the sofa armrest gives a classic, sophisticated look for the living room. A handmade quilted throw guarantees a unique personal look. Tip: Matching a throw with pillows gives a living room an elegant touch. Add a table runner to your surfaces. These delight additions are for more than the dining room table. They add color as well as protection. Think about a bit of color on the sofa table or the cocktail table. Table runners come in a variety of styles and colors and will not break the bank. Click here to find just the right size table runner. Give dreary wood furniture a fresh and fast makeover with paint. Paint is a terrific way to get a modern color schemes for your living room. Try a fun painting technique to update with a bold color. 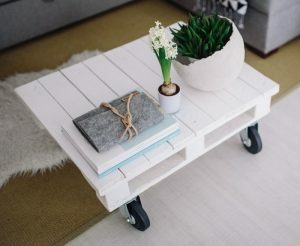 Give new life to old stuffy furniture. Tip : Painter’s tape is a great way to add a simple yet chic patterns like stripes and squares. Lighting can set or change a mood, make small spaces appear larger, and brighten a color scheme. Consider using LED bulbs in place of the existing one. This small item will brighten a dark living room. 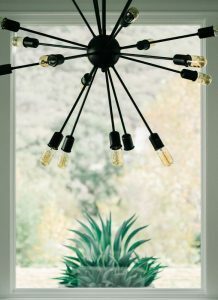 Other ideas to update your living room lighting include swapping lampshades, painting a floor, or adding a new ceiling fixture. 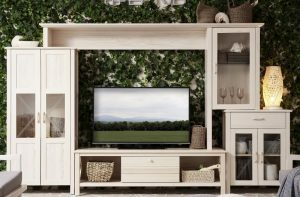 Update your living room by including plenty of lush, green plants. Adding even a small touch of greenery is sure to make your living room healthier and feel more alive. Small trees make an empty corner suddenly stylish, while small indoor greenery can update side tables, bookshelves and consoles. Tip: If you have a brown thumb, get a branch and place it into a sturdy decorative container or vase for trouble free greenery. 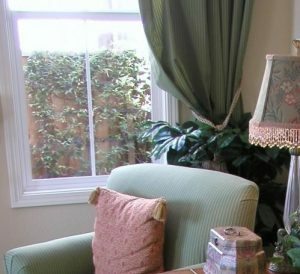 You don’t need brand-new drapes or blinds to update your window treatments. Improve current curtains with a modern paint treatment, or with a fun or fancy trim. Add trim to blind tape by gluing on trim. Add wall paper or paint vertical blinds. Try new tiebacks to renew the look of your living room. Try some or all of these ideas and watch your living room take on a new life. Do you have any additional tips to add based on your experiences? Which updating ideas do you love the most? Please let me know in the comments. P.S. You can use these ideas for the holidays.